Tall, frilly Blue Columbines brushed against her dress, perfuming the warm air, as Juliet slipped into the greenery that bordered her Neohome. What a perfect start to Valentine's Day, the chocolate Usul thought. This guide will show you an easy strategy that can earn you a nice new trophy for your lookup! This is dedicated for Valentine's Day. 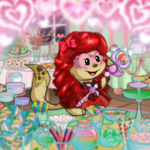 We hope you find our suggestions useful in finding the perfect NC items to add to your Neopets Valentines Day attire. The yellow Lupe looked at the Neomail that he held in one large hand. Memories flooded him, made him recall a snowy day when he had still been a wild young Lupe.